Black Ice Software - Document Converter version 1.23 and BiBatchConverter 4.30 is released! 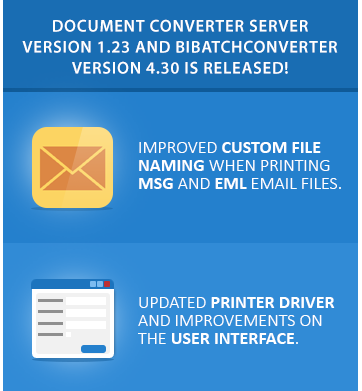 Document Converter Server version 1.23 and BiBatchConverter 4.30 is released! Improved User Interface and stability improvements for Custom File Naming when printing Email files! Black Ice Software has released the Document Converter Server version 1.23 and BiBatchConverter 4.30. The new versions includes stability improvements for custom file name generation when printing MSG and EML files. The new custom file name generation allows you to merge MSG and EML email files with attachments. The improved custom file naming makes the Document Converter Server and BiBatchConverter an ideal solution for archiving, printing and organizing a large number of emails. The latest Document Converter Server and BiBatchConverter version also includes stability improvements for the registration on certain systems with certain network interfaces. Do not forget to subscribe to future releases by purchasing maintenance. With an active maintenance subscription, you will receive all new releases for free! Priority email technical support is also included in your subscription. For more information, call us at +1 (561)-757-4107 Extension 3, or impactsales@blackice.com. Download the Latest Document Converter and BiBatchConverter!